The AmericanAirlines Arena specializes in unique events utilizing arena special effects, sound elements and team entertainment for private parties and corporate meetings. Catering menus are custom designed to fit most themes and budgets in this one stop shop venue. Located on the event level, these ultra-premium clubs features a formal dining room and lounge area. Perfect for meetings or private parties, the AmericanAirlines Lounges offer both comfort and luxury in an exclusive club, available on non-event days only. Located on the premium suite level, this private room has all the amenities of an exclusive sports bar and more. Your guests will enjoy the luxury and comfort of the plush executive style furniture, lounge and bar area, and a spectacular view of the arena interior, perfect for a “backstage” experience before a concert or a reception on a non-event day. Join us prior to Tip-Off for a unique and trendy dining experience featuring an all-new dining experience for the 2017/18 season featuring local Miami flavors, combined with an inspired Japanese flair. Hyde’s re-imagined menu is a unique approach to upscale bar food with new items such as Chicken and Waffles, Hyde Poke Bowl, Wagyu Sliders, Japanese Steak Tacos or sample the HEAT Roll – one of Hyde’s most famous sushi dishes. 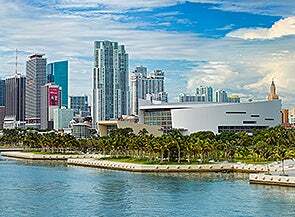 The 23,000 square foot outdoor space located on the east side of the Arena, provides a stunning view of Biscayne Bay and the Miami skyline. HEAT Fans are encouraged to arrive early and enter Gates 5 & 6 to enjoy expertly crafted cocktails and spirits at the BACARDÍ Bar, food from local, live music and/or entertainment, a variety of seating options and three The Miami HEAT Store retail kiosks. For select Arena events, guests can enjoy a pre-concert party on the plaza with drinks and music, in a club-like setting. The Xfinity East Plaza can also be customized for Special Events, Private Concerts or Group Dining on game and event days. Fans can use the complimentary high-speed Xfinity WiFi to stay connected, post on social media or stream their favorite entertainment on the go. 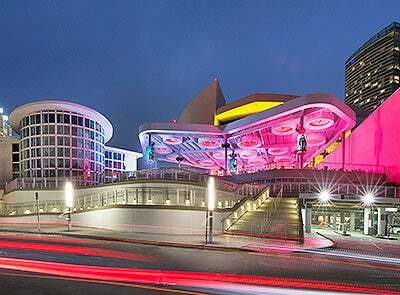 Welcome to AmericanAirlines Arena, a state-of-the-art multi-purpose LEED certified facility that is South Florida’s pre-eminent sports and entertainment venue. Our highly professional staff is committed to providing the highest standards of service and to ensuring the best possible experience for both you and your guests. Access the Promoter Kit by clicking here. Play or dine where the HEAT play! Perfect for sporting events, concerts, large banquets, and creative teambuilding events, the versatility of our floor accommodates all types of entertainment! An event hosted on the HEAT’s home court is guaranteed to score with your guests! Looking to entertain in style? The Premium Party Suite offers a spectacular view of the concert stage in a social setting. It's a great place to entertain clients, co-workers, friends or family. Dine in the lounge area from Levy Restaurants award winning suite menu or relax in the comfort of ​stadium-style seats. Sit back, relax and enjoy the best events in sports and live entertainment! AmericanAirlines Arena offers a unique setting for both still photography & video shoots, inside and around the Arena. To inquire about a photo shoot or to film at AmericanAirlines Arena, please take a moment to share some details about your photo/video shoot needs. The information that you provide will be reviewed along with venue availability. The approval process to confirm availability may take up to (2) business days. For assistance, please call 786-777-1464 or email [email protected] for more information. Thank you for your interest in AmericanAirlines Arena. Please take a moment to share some details about your Event. The information that you provide will be reviewed along with venue availability. The approval process to confirm availability may take up to (2) business days. 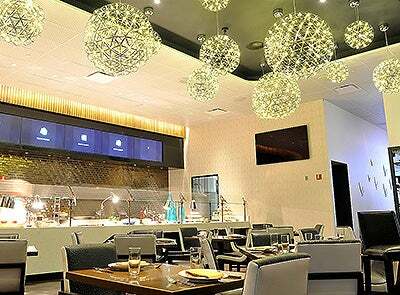 Hyde Lounge at AmericanAirlines Arena is a Chic, Intimate, Getaway for nightlife connoisseurs, Hyde Lounge is the ultimate in exclusive socializing…and perfect for Corporate Special Events or private parties. Treat your guests like VIP’s as they enjoy the 1,400 sq. 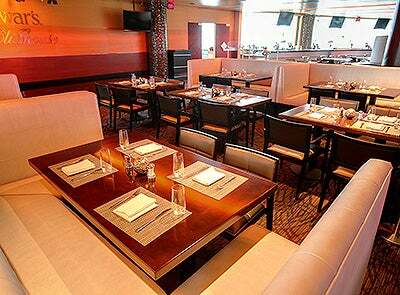 ft. intimate club located on the event level of AmericanAirlines Arena. The club’s posh décor, intimate table seating and state-of-the-art sound and lighting features make Hyde the ultimate party location for groups up to 250 people. With fresh sushi and South American infused dishes as envisioned by sbe Executive Chef, Jose Icardi, Multiple Bars, Lounge Seating and Specialty cocktails created by renowned mixologists, using only the freshest juices and ingredients. Boasting the highest service standards, Hyde Lounge is the premiere place to host your next special event. HEAT Fans can enjoy the ultimate nightlife experience at Hyde Lounge without leaving the Arena. Come dine, chill and enjoy cocktails in the supper club lounge atmosphere through the first 3 quarters of the game and experience the transition to a hot, chic nightclub from the 4th quarter until closing. Treat your guests like MVP’s with one of the exclusive private Table’s featuring Bottle Service and the hottest trends in Mixology. The Hyde hosts and staff are at your service to cater to your every need. How to Access Hyde Lounge after Miami HEAT games: The Hyde VIP Services team will be located on the Main Concourse between Sections 114-115. Join us starting one hour prior to every concert for a Katsuya-inspired Japanese and Sushi menu alongside Award-winning Mixology and signature HYDE Cocktails such as The Love Unit. The Hyde VIP Services team will be located on the Main Concourse between Sections 114-115. *Guests must have a valid AmericanAirlines Arena concert ticket for access to Hyde Lounge presented by Beck's following select events. Please check available concerts on www.aaarena.com homepage and click the event of your choice. Post-concert parties in Hyde Lounge presented by Beck's will be noted OPEN for select shows. For more information or to reserve a Table, Please contact: [email protected] or call 786.231.1218. Location availability to be determined up to 30 days prior to date request. (Due to Arena security protocol, no interior or exterior photo/video shoot access will be granted on event or game days). No building, team or sponsor intellectual property, logos or marks are allowed to be filmed unless written permission is provided by The HEAT Group and/or the NBA. The event time can be extended for an addition fee, based on event schedules and availability. Catering inside of the building must be provided by Levy Restaurants. Approved Exterior shoots can use off-premise catering service, provided no food or beverage is brought on Arena property. Levy Restaurants can be reached at 786-777-2076.